A thug who took part in an "ugly and extreme" gang attack on a traffic warden has been detained for nine months. Danyal Bashir, 20, was caught on camera as bystanders "voyeuristically" filmed the brutal attack on Birmingham warden Charlie Weston, whose head was repeatedly stamped on. The city's Crown Court was told Bashir, of Hartopp Road, Alum Rock, attempted to rip off the victim's motorcycle helmet as he was dragged off his bike by up to six men in a "sustained" attack in September. Prosecutor Gary Cook said Bashir was identified by police after footage of the incident was widely shared on the internet, leaving Mr Weston to feel social media viewers were "glorifying in his misery". Bashir joined in with kicks to Mr Weston's head and body in Hartopp Road, after an early incident in which he had waited for a woman to move an illegally parked car. During the first incident, which led to police being called, Mr Weston was pushed in the chest and told that he would be run over. Describing the subsequent attack, which left the victim with cuts and bruising, Mr Cook added: "Six males approached Mr Weston, they surrounded him and asked him whether he liked shouting at a woman. "He was then punched to the side of the head and someone kicked his bike and he fell over into the road. "He challenged the men as to what they were playing at and he was then, whilst on the ground, kicked and stamped on repeatedly. "He recalls his head being impacted a number of times. "It seemed to him to last an eternity and then it stopped." Bashir, who has a previous conviction for assault, admitted assault occasioning actual bodily harm at a previous hearing. He was ordered to spend nine months in a young offenders' institution. Defence barrister Mohammad Hafeez told the court: "He is a young man who is genuinely remorseful and ashamed of his actions. "This was a moment of madness as far as he's concerned. "It was sheer madness to assault Mr Weston the way he did. "Through me and through letters he has written to Your Honour, he apologises to Mr Weston and Mr Weston's family unreservedly." Sentencing Bashir on Friday, Judge Kristina Montgomery QC said: "What you did that day for nothing more than your own sense of personal gratification... was completely unacceptable. "You had not a thought to the consequences of your actions as you rushed in to perform your own summary justice. "Rather than taking a step back you decided to join others in acting some sort of revenge on what you thought was a slight." The judge added: "I accept that you are now genuinely remorseful, but the true reflection of your character, Mr Bashir, is in your actions not in your words." 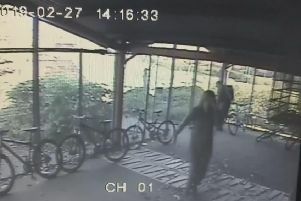 Speaking of the CCTV, Judge Montgomery said: "It demonstrates a vicious group attack for which you are very much involved, if not a significant or leading role. "You tried to remove his helmet which showed your plain intention to cause him harm."